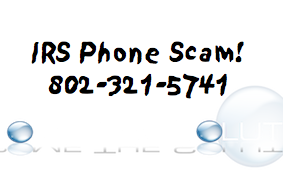 If you receive a call from 802-321-5741 with an automated voice (female) stating the following or something similar. There are absolutely no details (no name or information that can point to you) in the message. This is certainly scam. Do not call this number back! If you have receiving this message or a similar message, let us know in the comments below. Now coming from 802-321-3255, female voice, the message was choppy through 90% of the message like bad cell reception. I heard the words Tax Fraud and a few others. I received this call multiple time from several numbers. Called it back. What will happen? Same call here. Scarry feeling, but happy it s a scam. They should be jailed! I received a call to all this # 802-321-5736 I know it is a scam What happens if I call them? I don't want them to keep calling me. I got a call from them. This is what they said to me. "You will be taken under custody by the local cops as there are for serious allegations pressed on your name at this moment we would request you get back to us so we can discuss about the case before taking any legal action against you. The number to reach us is (802) 321-5741 thank you." I got a call from them. This is what they said to me. "You will be taken under custody by the local cops as there are for serious allegations pressed on your name at this moment we would request you get back to us so we can discuss about the case before taking any legal action against you. The number to reach us is (802) 321-5741 thank you."